Mark and Irene Wilkie and Kerry and Henk Faber. Well the hyperbole was very warranted. Three absolutely fantastic games were in progress and the Club faithful did gather and got to watch some great games. 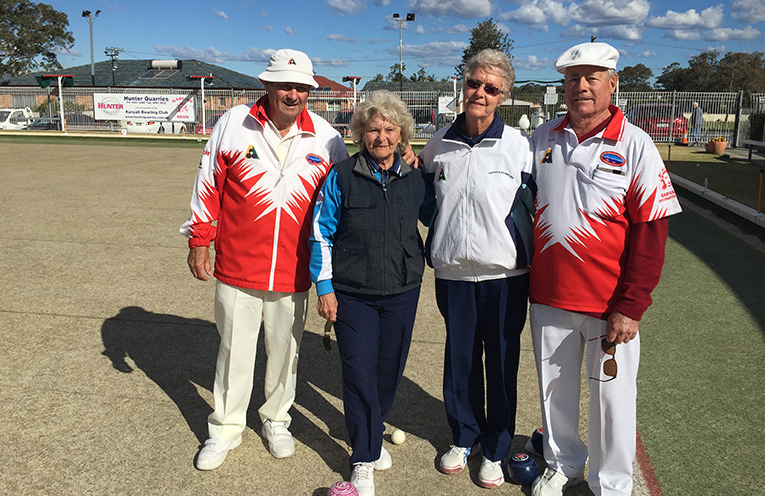 New Club President Sam and his wife Merridee Rees got up in a tightly contested game over Gary and Joan Allerton in the last 3 ends to win 23/17. Jason and Olive got up over Gordon and Robyn Latimore by 1 shot on the last end to win 21/20 in a cliffhanger. In the last game to finish Kerry and Henk Faber played some of their best ever bowls to get up by 1 shot having needed 2 on the last end and getting up 20/21 over a gallant Irene and Mark Wilkie. The big crowd watching stayed to the end and cheered the high quality bowls all the way. The RSL Club announcer even paused the monster Saturday raffle results to tell the clubs patrons that family feuds were in progress out on the greens and the crowd flowed outside to watch. Great Bowls and of course the usual price of seats is free!